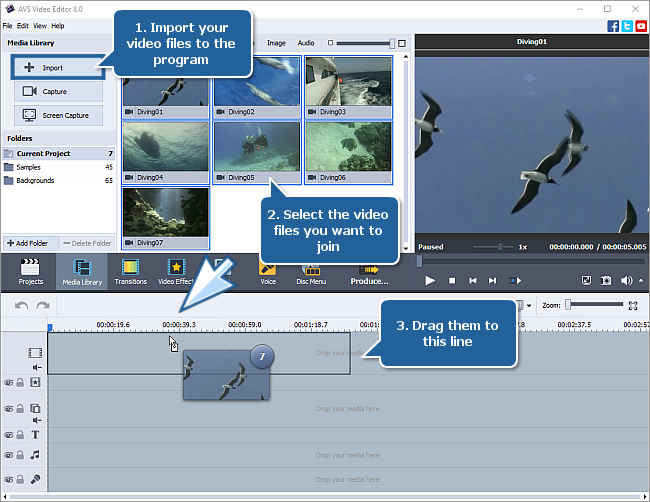 If you make a home movie and want to merge several video recordings into a single file, you need to use a video joiner. AVS Video Editor supports all popular video formats and allows you to quickly and easily set the scene sequence, apply transitions between your video clips so that they play smoothly one after another and save the result as a single file. It's also possible to combine videos with several photos. This easy-to-use but powerful software provides a lot of features so that you can not only merge videos but also enhance your joined video with different video effects and filters, titles and credits, music etc. 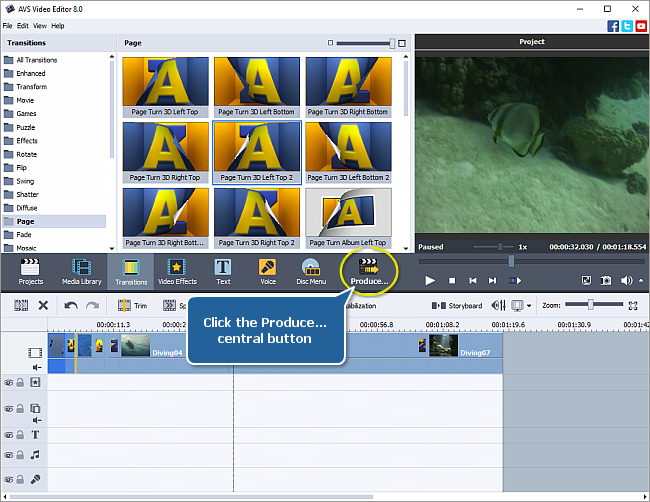 Use the Import button in the Media Library to upload your video files into the program. The files will be placed in the Files and Effects area. Then select the videos you want to join and drag-and-drop them to the Main Video line of the Timeline. Alternatively, you can select all the necessary files stored in a folder on your PC and drag-and-drop the videos directly to the Timeline. You will be asked if you want to set the project aspect ratio in accordance with the aspect ratio of the first video file. It is recommended to set up the aspect ratio for your project at the beginning of your work to avoid distortions of the output video. 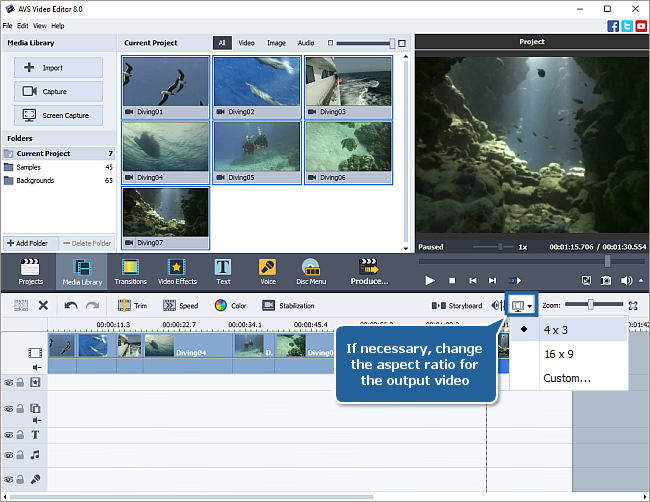 To change the aspect ratio that will be used for the resulting video, click the Project Aspect Ratio button above the Timeline and select the necessary option from the list. To learn more on how to set the aspect ratio you can refer to our Online Help. If your input files have different aspect ratios, you can also use the Crop Scale feature to remove black bars on the edges of the video image. Now you can change the sequence of the files at the Timeline. Right-click the file you want to move and use the Move Left or Move Right option from the express menu. 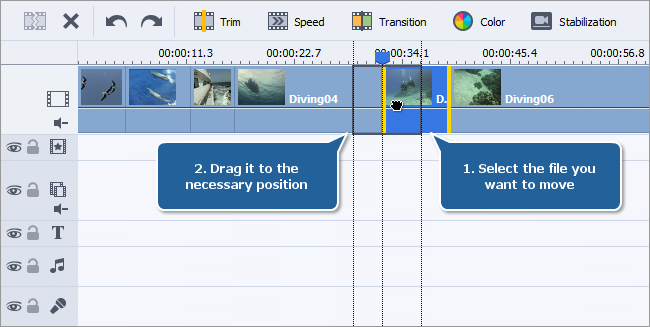 It is also possible to drag-and-drop video clips at the Timeline to the left or to the right to change their order. Note: if you manually drag a clip to the left so that it doesn't reach the left border of the previous clip, the clips will not change their positions but the Fade transition will be created between these clips. You can apply transitions between your video clips to ensure that one scene smoothly goes into another. This also helps to make the resulting video more impressive. To work with transitions easier, switch to the Storyboard view using the Storyboard button above the Timeline. Press the Transitions central button to display all the available transitions. Use the menu on the left side of the Files and Effects area to switch between the available transition categories, such as Transform, Rotate, Diffuse and much more. 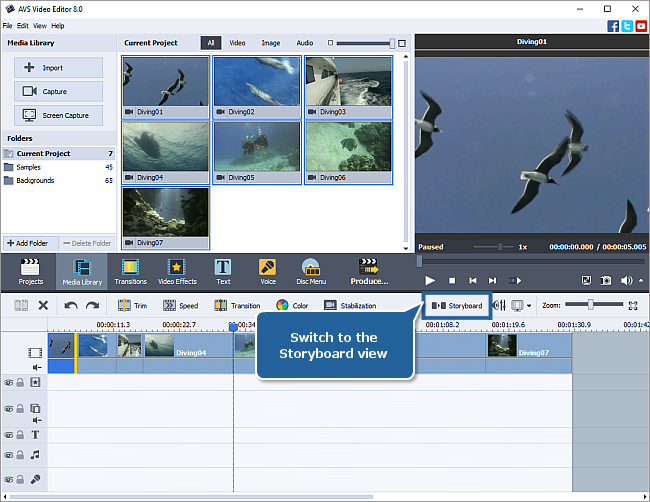 Click the necessary transition with the left mouse button and drag-and-drop it to the place between two video clips on the Storyboard. Add or Replace Transition - to add a certain transition to the previously selected place between two videos on the Storyboard. 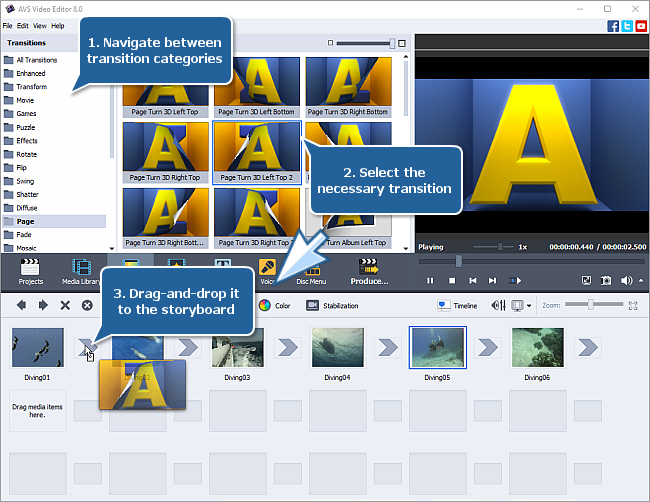 Apply Transition to All - to automatically add one and the same transition between all your videos. 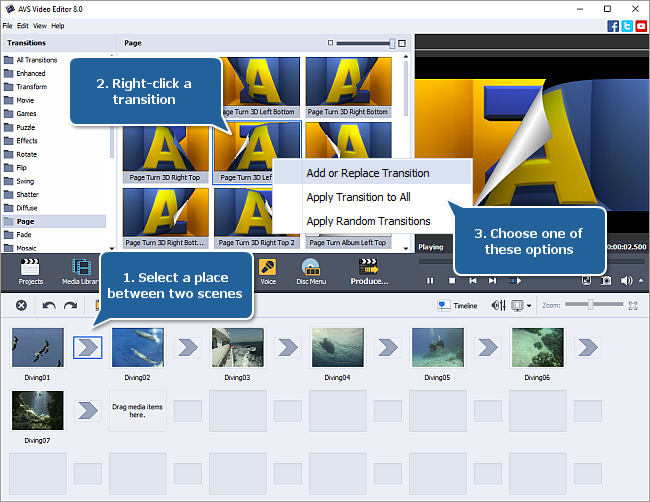 Apply Random Transitions - to automatically apply different transitions between all videos. If you want to adjust the added transition duration, please refer to this guide to learn more on how this can be done. Once you add all the transitions, press the Timeline button to return to the Timeline view. Now you can proceed to saving your video to an appropriate file format. Click the Produce... central button to start saving the result. get a video file that can be uploaded into popular web services, such as YouTube, Facebook etc. Just follow the wizard steps to export your video into the necessary format. If you need more information on how to save the video, you can refer to this guide. That's all. You have successfully joined your separate video clips into a single movie with beautiful transitions.